This presentation is an insight into what Andrew Nacin (@nacin) and Daryl Koopersmith (@darylkoop) are thinking about, as it pertains to the next few years of WordPress. Nacin is a developer with Matt Mullenweg’s Audrey Capital and Daryl works for Automattic’s WordPress.org team. The real title: “WordPress isn’t good enough.” There are so many more things that can be done to make WordPress better. Which, was pretty much the essence of the talk. Improve stability. WordPress should be stable, for anything that you’re doing. How many people have lost content and had to recover through revisions or going back through browser history? It doesn’t happen often, but it still does sometime. There’s a Google Summer of Code project to use local storage in your browser to back up your drafts. Plugin compatibility. It should be easier to know whether your plugins are compatible with the latest version of WordPress. Seamless updates. WordPress should update automatically. Many users are distributed amongst a few different versions of Firefox (3, 4, 5, and 6). With Chrome, the version you’re on is less apparent but you can still track it down. On Facebook, there’s no way for you to know which version you’re on. More seamless updates means faster release cycles and better improvements. Ease of use. Introduce simpler ways to post content. “Telling someone what to do is not as good as making it obvious.” New users should be able to immediately create content. Better media handling. WordPress needs to improve how it handles non-text content. In the pipeline are a drag and drop media uploader, and a new workflow for managing media content. Marc Lavallee (@lavallee) and Wes Lindamood (@lindamood) are half of the NPR Project Argo team. Both were relatively new to WordPress when they started; today they’ll be talking about the zen of using plugins. “Each plugin speaks with it’s own voice,” says Wes. Sometimes they can produced cluttered and confused experiences for your users. The framework they’ve chosen as it relates to plugins is use, patch or build. “Use” means they install the plugin, activate it, and it’s live. They may make minimal modifications with CSS, but it’s generally fine to go out of the box. “Patch” means they may make minor modifications to the codebase, through hooks or actually changing core, and then try to push the improvements they made back upstream. “Build” means they take ideas and inspiration from other options in the WordPress plugin directory, and roll their own plugin. The Argo team decided to build a photo slideshow plugin that leveraged WordPress’ built in gallery functionality, and looked and worked as a standard slideshow. Improvements included reducing the footprint of the plugin from 39k/895 lines to 8k/244 lines. To make their content more engaging, Argo wanted it to make it easy for their reporters to embed rich media. Initially, this looked like Embedly or oEmbed but they didn’t want to cede control of what was embedded to the content provider. Solution: A custom post type called Jiffy Posts. Reporters could create a new post with a title, short comment, link to the referenced media, and can include source attribution. Doing it this way, instead of having reporters embed rich media in the post, ensures there’s presentation consistency from post to post and content type to content type. Ultimate takeaway: The decisions and opinions of plugin authors can directly impact the user experience of your website. Think about this more holistically, beyond just reviewing whether the code is clean. The slides from the presentation are available on Slideshare and download as a PDF. Frederick Townes is the founder of W3 Edge, CTO at Mashable and author of W3 Total Cache. He’s presenting today on WordPress theme performance best practices.First, he recommends contributing back to the WordPress Codex because everyone in the room thinks it could be improved. Pay lots of attention to the hierarchy with page templates. Think about how many files you’re loading into memory, and the overall footprint they end up consuming. You can track this down using xdebug. The larger the heap, the greater the execution time. “Graduate” groups functions to plugins. The fewer files the better. Explore and use microformats for reviews, businesses & organizations, products, and people. Use external services and fail gracefully. 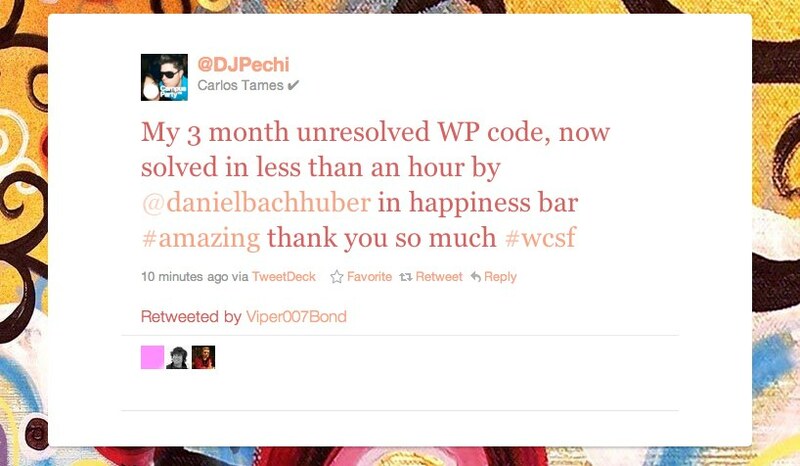 W3 Total Cache has a debug mode that will show you what’s being cached on a request and what’s being missed. What does enterprise mean? In the context of the WordPress presentation: sites on a large scale. Sites with a lot of traffic, content, and that require high availability. Conde Nast started migrating a lot of sites from Movable Type to WordPress in 2008-2009, and the total number has only been growing. Migration don’t: Forget your image assets. Neat trick: If you don’t know whether all of your image assets were copied over, write a script to tail Apache/Nginx request log, watch for 404s, and pull the image over from the old environment if the request 404’s.